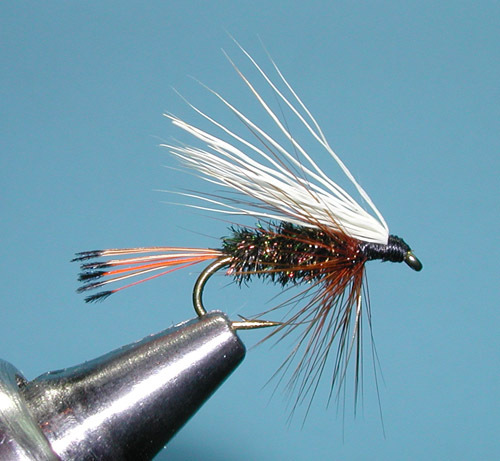 Notes: The Western Coachman was designed by Wayne "Buz" Buszek of Visalia, CA in 1939 or 1940 as a wet fly. Buz would fish this pattern extensively throughout the Southern Sierra, particularly the Kings River, for both Rainbows and Browns. He had a fly shop in Visalia and this was his number one pattern. The pattern became more popular by the promotion of the Pacific Coast Olive Company as they purchased 2,000 Western Coachman flies in 1949. When you purchased their olives, you would receive one of Buz's Western Coachman flies in a metal container. A little later, the Orvis Company marketed the Western Coachman within their inventory of fly patterns. The Western Coachman was patterned after the wet version of the Orvis Company's Royal Coachman which was designed in 1878. Buz redesigned the wing using coarse white deer hair that extended over the body to the center of the tail. Buz would even the tips of deer hair with a copper pipe which was the forerunner to the hair eveners we use today. The term "coachman' goes back even further as the original coachman designs were from the 1830's when the coachman to the Royal Family of England, Tom Bosworth, came up with the basic pattern design, the Coachman. Today, Buz is remembered by the "Buz Buszek Award" given by the International Federation of Fly Fishers recognizing the finest Fly Tiers in the world. Dead drift through deep, fast moving runs and especially at the head of pools. 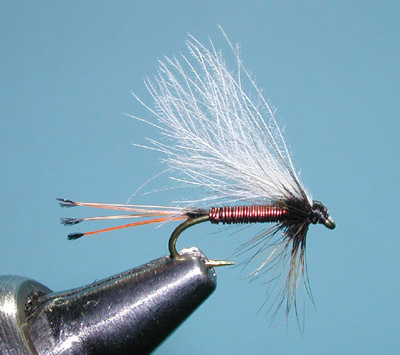 Fish fly down tail-outs with a quick lift at the end of the drift causing the fly to lift rapidly as if emerging (as caddis do) to escape the water quickly. In both cases, you'll feel a strong take, especially when rising the fly at the end of the drift, so be sure to have a heavy tippet. 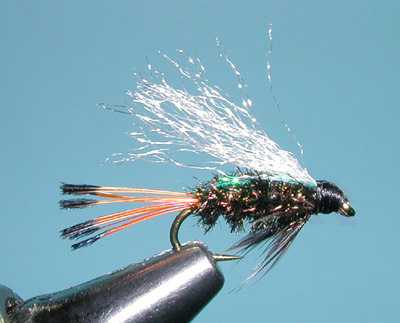 Variations include the Flashback Western Coachman designed by Colorado Fly Tier, Paul Prentiss and Hans Weilenmann's version of the Wet Wire Western Coachman designed by Dennis Collier.